I went to a jewelry-making class. Now, what I know about crafting jewelry would make for a very short conversation. But into the class I went. I didn’t really feel like it, but I’d committed to going. 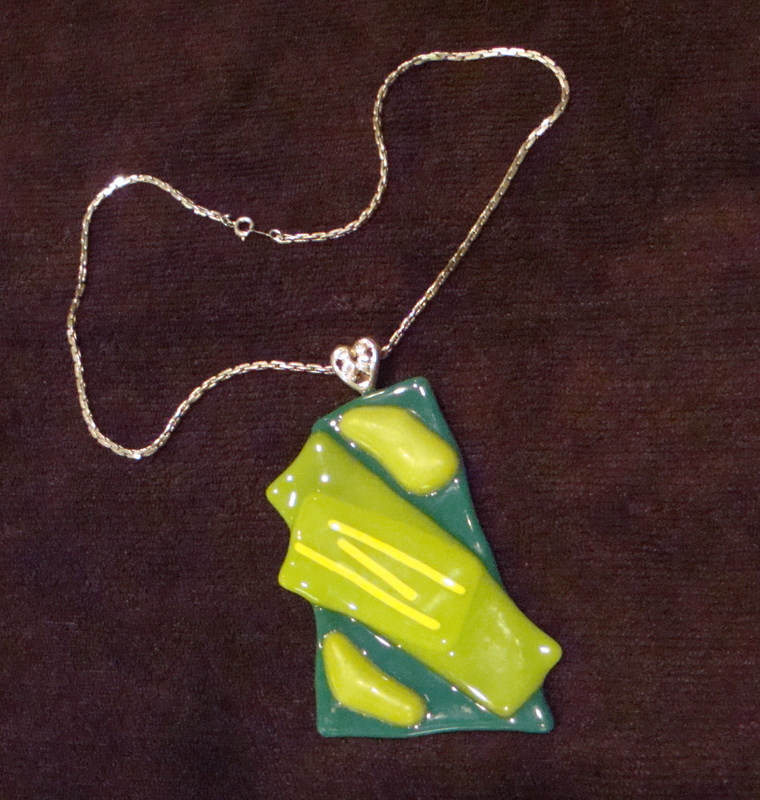 The project was a glass pendant and/or earrings. We were an assorted group, writers nestled among artists (some were experienced jewelry makers.) After instruction, we began the hands-on. 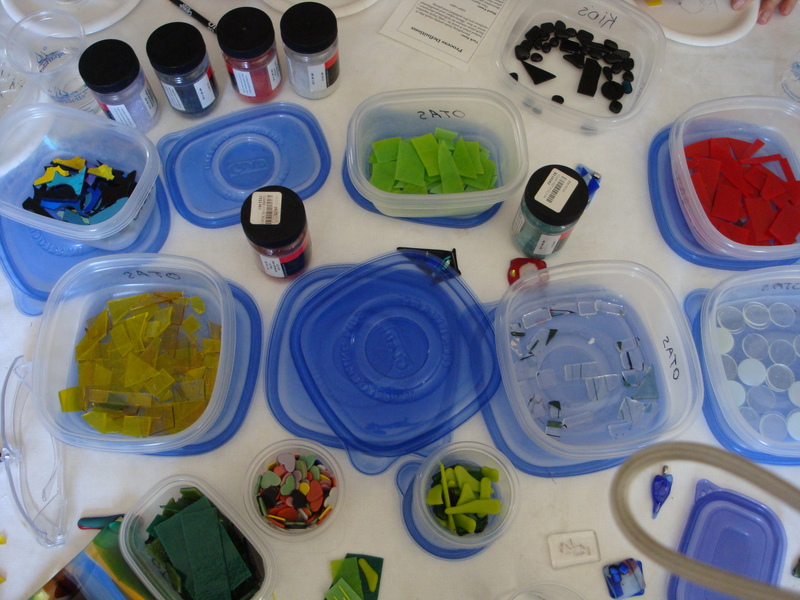 The table was spread with a smorgasbord of glass, all colors and shapes, some translucent, some opaque. Did I mention feeling a little pressure? A little discomfort? E-e-ewe. We sorted through shapes and cut our own pieces of glass. We assembled and reassembled and experimented. We polished and glued. Animated conversations turned to subdued or nonexistent ones and, briefly, the room grew quiet. 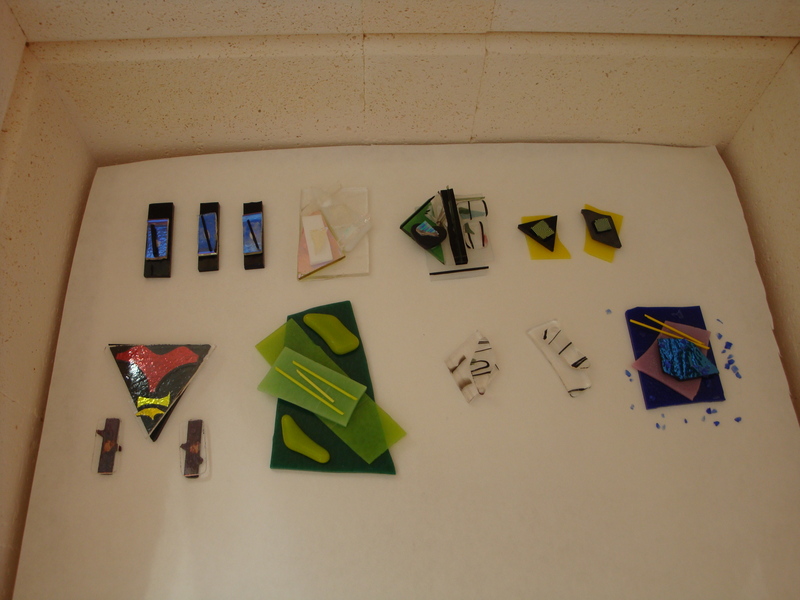 The jewelry pieces were then placed on kiln paper, ready to be fired and fused. I’m tall and like big jewelry. You probably can tell which is mine. Leaving my pendant to the fates and later date pick-up, I returned home, but not to my office. The next day, it seemed a fresh wind had blown through the house and swept away some story debris. Mind you, the work was as I’d left it, but I definitely felt renewed and up to the challenge. The most valuable part of all this? As uncomfortable as I might have been in the class, nothing was in my mind except a little stack of green glass. Who knew of its medicinal ability to help clear a word-clogged, befogged head? This entry was posted in Creativity, fiction writing, Finding Ideas: The Creative Process, Inspiration, Looking for Inspiration, Writing and tagged discomfort zone, fusing glass jewelry, glass jewelry, jewelry making, out of the comfort zone, sparking creativity, stepping out of the box, trying something new. Bookmark the permalink. I took a mosaic class last winter and really enjoyed it! I understand the nervousness of creating on the fly, since we had 3 hours to create an art piece and none of us understood the aspects of designing with tile; selecting from a variety of tiles sizes, color, textures, learning how to cut or saw the pieces and then placing them together and lastly selecting a color for the caulk. The conversation, like you said, died down to nothing. But the experience was very enjoyable and liberating and I love my mosaic mirror even if it isn’t perfect. I would love to make a table top. Your pin looks nice already! I think we had a similar experience, one that ultimately turned out to be fun. I enjoyed seeing what each person did: their glass choices and design. Would love to see your mirror! Well said. I think you spoke for many of us. I was out of my comfort zone, but it was fun. It will be interesting to see how they all turned out. Yes, I’m anxious to see the results!